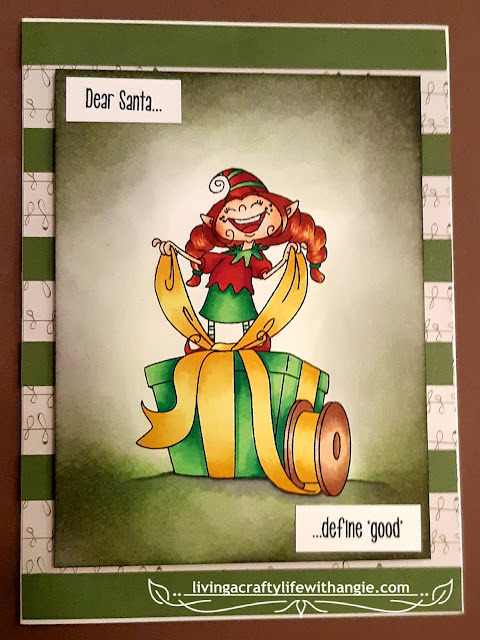 I am very excited to share that after being absolutely obsessed with Kraftin' Kimmie Stamps, I shared my work and was chosen as a guest designer. Be sure to check back daily this week because this is only day 1 of the January release. 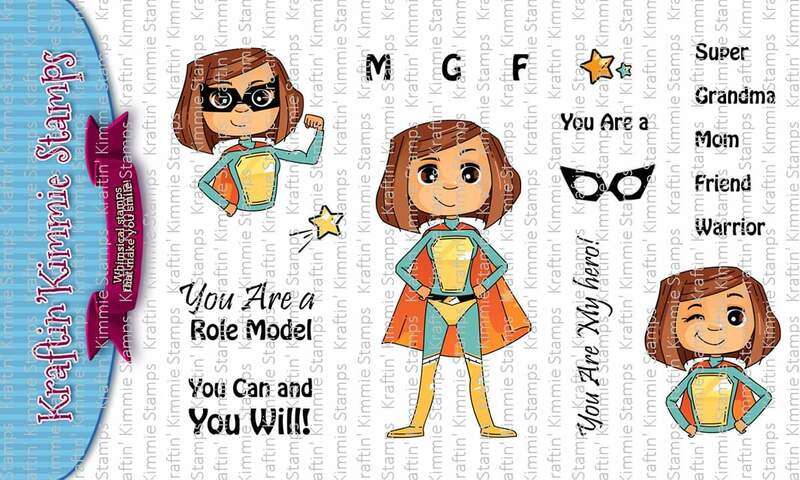 Welcome to the FIRST release of this brand new year at Kraftin' Kimmie Stamps! This is Day ONE of our January Krafty Peeks and we are over the moon excited to share everything with you! 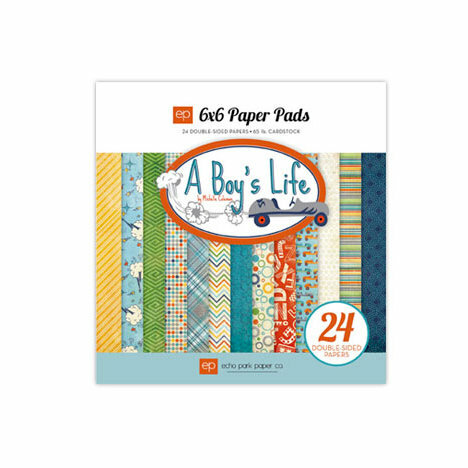 We've got new stamp sets, new stencils, new ink, a BRAND NEW PRODUCT and we're thrilled to be introducing you to our NEW ARTIST! Hang on tight...'cause here we go! The first set for January that we are sharing with you is called YOU ARE SUPER and is from our brand new artist, Neda Sadreddin! We all have women and girls in our lives who are superheros to us and to others! Just by being themselves as a Mom, a Grandma, a Friend...and we need to tell them more often how AWESOME we think they are! So here comes the perfect stamp set! It features a main full sized image plus two portrait sized images in different super cute poses! You can add a mask and even different letters to her chest to make it personal for the recipient! There are several sentiments and options to create your own! I think you'll agree this is a fabulous first set from Neda! Here is my creation using this spectacular set. 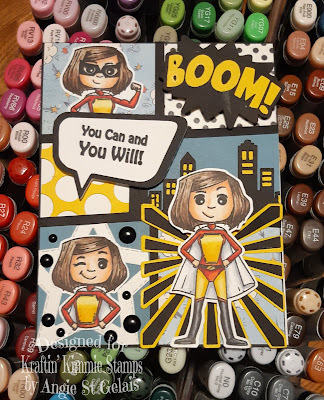 I channeled my inner super hero to create this comic book inspired card. I created this 4 1/4" x 5 1/2" top folding card using 110lb cover stock. 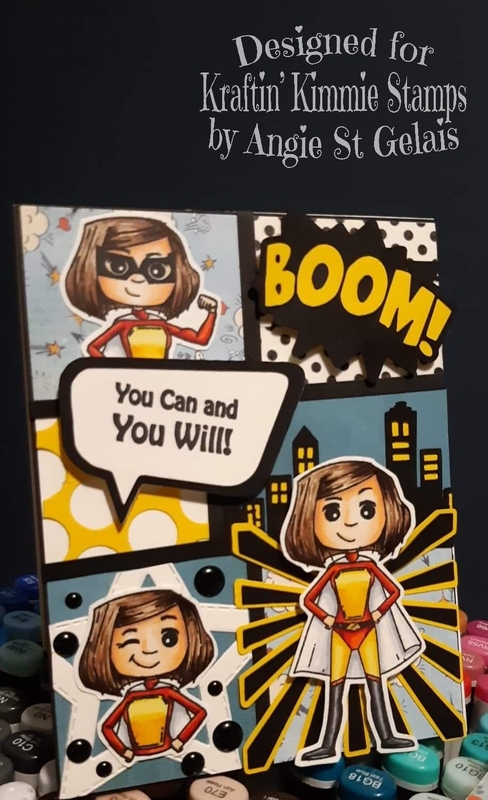 I created the "boom" , city skyline , word bubble and burst using the designer features on my Silhouette. All patterned paper was from the Echo Park's A Boy's Life collection. I used black dotted Washi tape to create the dots behind the "boom". I used nestling star dies to create the star. And last but not least the yellow dotted piece is in fact a We R Memory Keepers die called Polka Dots cut outs die. You'll get to see ALL of our new goodies in action over the next few days of January Krafty Peeks and they'll all be released at our LIVE Online Release Party on Saturday, January 12 at 2pm EST in the Krafty Friends group! For now, hop around and check out some samples from our incredible Krafty Team! You might spot some other new goodies while you're hopping around....and I'll tell you more about them tomorrow!! So come on back! This is the COOLEST! It looks like a comic book! Great idea! This is awesome! Designed to mimic a comic book! Such a great idea! Love this card! Great job Angie to capture the Super Powers we all have!! LOVE everything about this card!!! Love your storyboarding! Great card!